Natural body detoxification is a very desirable modality to complement Quantum Biofeedback. There are many body detoxification methods available today. The EPFX SCIO Biofeedback Device has a body detoxification program contained within its multitude of programs. It is a gentle, natural detox. We energetically balance your organs of elimination then assist your body to release any toxins by stimulating your system with the appropriate frequencies. Diet plays a big part in natural body detoxification. 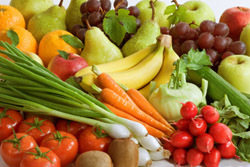 If you eat plenty of fresh fruit and vegetables, drink lots of pure water, have a fibre rich diet and exercise regularly, then the majority of toxins and waste will be eliminated naturally. Poor dietary choices and environmental issues can, however, cause a build-up of toxins in our system. Also, some people are unable to produce enough enzymes to sufficiently digest their food. When considering a body detox you need to be aware of the different factors that can cause a build-up of toxins in our system. Below is a list of some of the main toxins, all or some of us are exposed to at different times. Detoxification is not advisable for all clients. Some clients can be in a very weakened state of health when they first decide to try Quantum Biofeedback. In these cases, we would always try to build you up before trying to activate any cleansing within your body. Detoxing can be quite beneficial when you are ready for it. By having some regular biofeedback sessions you can greatly reduce the overall stress you are experiencing, physically, mentally and emotionally. If you allow us to build up your system first, sometimes your body will start its own detoxing naturally, of its own accord. Our skilled practitioners can make the whole process smooth and effortless. Replacing caffeine and alcoholic drinks with plenty of pure water also greatly assists with a smooth detoxification. As cleansing and detoxing can have a major effect on your overall health, we also offer an additional, more thorough body cleansing detox. For clients who wish to have a more thorough detox, we offer the Dr Mary Staggs Detox system. This system is the original Ionic Detox Foot Spa. Foot detoxification is a very powerful, effective, yet effortless way to stimulate auto-detoxification and cleanse your body. Whichever type of detoxification you choose, you can expect your general state of health and wellbeing to improve as you cleanse your system. You may experience a positive shift in your moods and improved energy levels. You may also experience a greater 'zest for life'.